Our family has recently rediscovered cabbage, so we’ve been eating cabbage salads every week. I’m not sure how we ever forgot about cabbage, but the crunch, the color, the healthiness – it’s really a great base for a summery salad. Last week I shared my chopped chicken salad, this is sort of a variation on that, but it has a little more ginger and a little less peanut. I made it for my mother-in-law and sister-in-law for a light, summery dinner, but it’d also be a great lunch. It’s also a good time to point out that I’ve started measuring lime juice in tablespoon and teaspoons recently and not in actual limes. I much prefer fresh limes, but in the recent lime crisis, I just can’t afford $1.79 per lime, so I bought a big jug of lime juice and I’ve been using that for everything except gin & tonics, which call for true lime wedges. I typically think a lime yields 2T of juice, but I also don’t really measure things like lime juice with any accuracy anyway. 1. Preheat the oven to 400. Mince the garlic and ginger. Stir the lime juice, garlic, ginger, soy sauce, and sriracha together to create a glaze. Brush the salmon on both sides with the glaze and create a packet of foil to bake the fish in. Bake the fish for 8-10 minutes, until the fish flakes easily with a fork. 2. Chop the cabbage, carrots, green onions, and spinach. Peel and dice the mango. Toss together in a large serving bowl. Chop the cilantro and sprinkle on top. 3. Combine the dressing ingredients together and whisk until well combined. Serve the salad with the warm fish on top, drizzled with dressing, topped with sesame seeds. 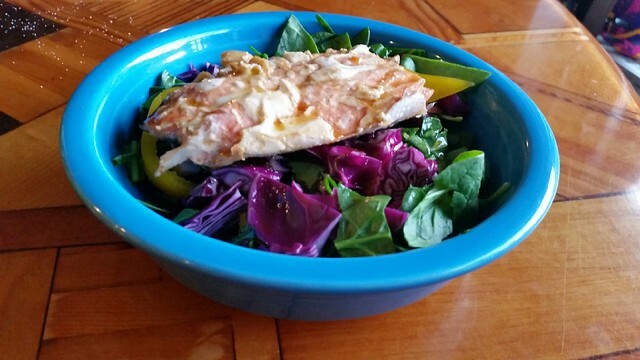 Nutrition: 539 calories for 1/4 of the salmon, salad, and dressing. 25g fat, 18g sugar, 33g protein. The lime crisis is over! Use real limes – they’re cheap again!